Lijiang Studio Index is a series of gatherings celebrating work and relationships made through Lijiang Studio, a residency in Yunnan, China. The premise of this iteration at City Bird Gallery in New York is to sweep up some evidence from a place on the other side of the world to show to each other, and to workshop rehearse and perform some new things amongst the detritus. It is a celebration of 10 years of work and play, and will include other 10-year celebrations performed by its other selves. We don’t assume we can know what emotions and experience any particular art refers to - a common problem. So we will start with an Index, or many indices, as points removed from those emotions yet capable of conjuring memory. An archival screening process to defuse the anxiety of representation. This index is built around the threshold and the belly of the space - Frog Wing to translate the work of the apprentice dongba priest Wu Zhimi for 191 Henry St. The still-animated fingers of Lijiang Studio in Latin America will scratch and scrape at the walls here, translated by Ernesto Salmeron. Na Yingyu’s remake of 1950’s Communist propaganda film “Smoke Signals from the Border” filmed at Lijiang Studio will clack and whip on the 16mm projector with sound from Li Jianhong. Recipes from Jixiang village by Emi Uemura, microbiotic performances from Sarah Lewison, music videos from Sylvia Winkler and Stephan Koperl, new music compositions translating ecological data from Jade Dragon Snow Mountain from Naima Fine will be present. A small Jixiang Orb will be there. New work from Crystal Pascucci and friends will be workshopped and rehearsed. Nightly free sounds, 7:30pm. Everybody welcome. "A river is..." was composed for a project with a Yale Haskins auditory research laboratory. It was created by Bill Solomon and Matt Sargent based on the writings of Bruno Hermann Repp on synchronization, rhythmic perception. "Tide (10+1 cellos)" was initially commissioned by the Null Point Festival (Buffalo, NY). The live cellist plays and responds to ten previous recordings through a series of pitch-matching instructions. The combination of many lines of cello produces a thick, gradually shifting timbre that very slowly alternates between cresting and receding, much like a series of waves against the shore." Bill Solomon performs with Ensemble Signal, having appeared at Lincoln Center, Tanglewood, LA Philharmonic, Guggenheim, Miller Theatre, Big Ears Festival, June in Buffalo and the Stone. He performed the solo vibraphone part for Pierre Boulez's Répons in collaboration with the Lucerne Festival, IRCAM and Ensemble InterContemporain with Mr. Boulez as conductor. Other solo appearances have included the New York City premiere of Unsuk Chin's Double Concerto, Harvard University, Victoriaville Festival and as a featured soloist at SEAMUS National Convention. He currently resides in New York City. 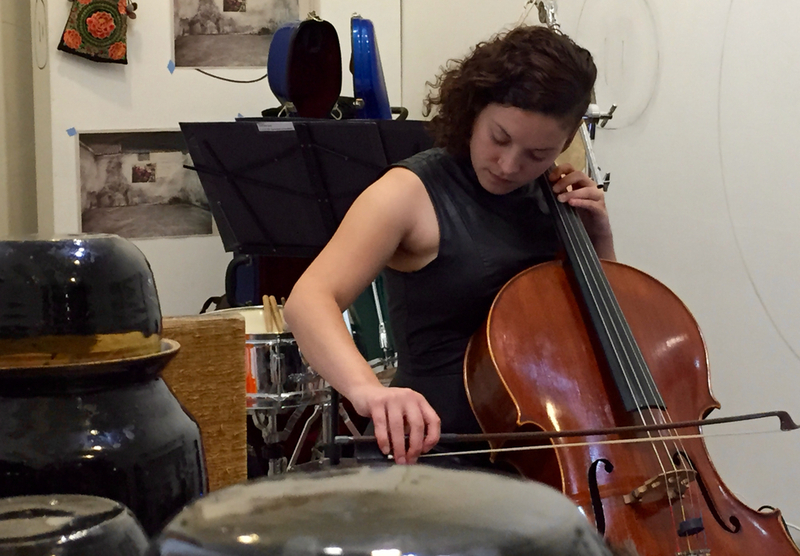 Crystal Pascucci is a cellist, composer and improviser. Her work focuses mainly on compositional techniques, with respect to notational styles; capabilities and restrictions. An active performer in the Bay Area, she has performed with the Paul Dresher Ensemble, Pamela Z, Roscoe Mitchell, William Winant Ensemble, David Wessel, Ellen Fullman, Greg Saunier, Zeena Parkins and David Behrman. She was a featured performer at the Festival for Contemporary Music, Soundwave Festival, and Switchboard Festival. 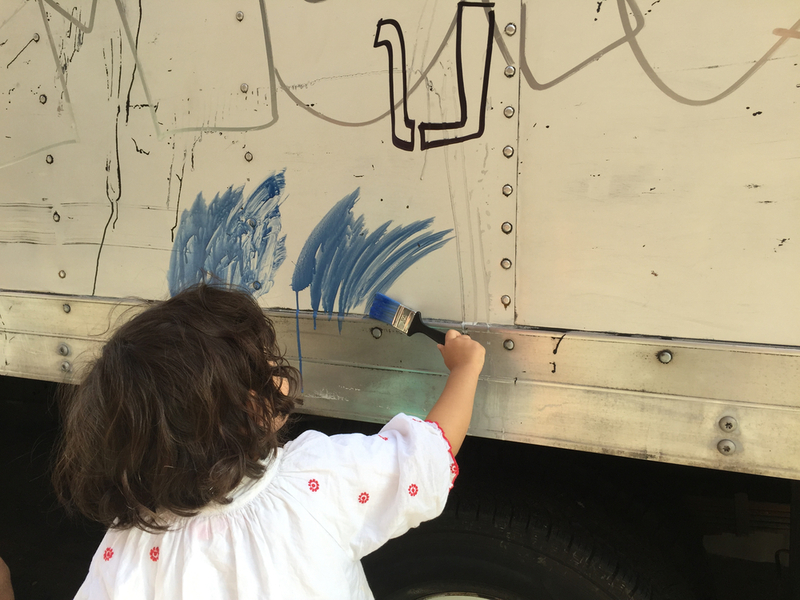 She has been commissioned by Transient Canvas (Boston) to write a new work through affiliated, Guerrilla Composer's Guild (SF). I grew up in Rhode Island and currently live and work in Providence’s Armory neighborhood. I graduated from the Rhode Island School of Design in 1996 with a BFA in painting after spending a summer at the Skowhegan School of Painting and Sculpture and a year in Rome as part of RISD’s European Honors Program. I have received the Rhode Island State Council for the Art’s merit and fellowship awards in painting. The past two years most of my effort has gone into my music project, playing shows around town, going on tour and putting out a tape. Emi Uemura, Hokkaido, Japan. Emi has been based in Halifax, Frankfurt, Beijing, and now Montreal. She worked with HomeShop (http://homeshop.org.cn/) in Beijing for several years. Projects include Chain Letter Dinner, Bento Delivery, Mobile Container Garden, Calendar Restaurant, Country Fair. At Lijiang Studio she curated Distortion of Distortion in 2014. Emily Bates, England, 1970. Bates became recognised for a body of work, or ‘impossible’ dresses, made during the 1990’s, that were constructed from knitted human hair, (such as Dress, Depilator and Sibilla). She has since concentrated on photography. Love Scenes, comprising photographic prints and a video installation shot in Yunnan, was shown as a solo exhibition at Casino, Forum d’art contemporain, Luxembourg in 2008, with an accompanying publication. Eric Van Hove, 1975, Algeria, lives and works in Marrakech, Morocco. Eric has worked and shown extensively around the world. His current project V12 Laraki is the remaking a Mercedes V-12 engine by hand in 53 materials using the specialties of Moroccan craftsmen. At Lijiang Studio he produced a work Naxi Love Suicide (Yuwoo). www.transcri.be. Ernesto Salmeron, Managua, 1977. Grew up in the middle of Nicaraguan conflict related with the Cold War. Studied Mass Communication and Media Arts at Universidad del Valle, Cali, Colombia. His Thesis was "AURAS DE GUERRA", later collected by TATE MODERN, London, and shown at the 52 Venice Biennale. His work is an ongoing research on environmentally sustainable relationships among average people. 1987. Brooklyn, NY. Born: East Los Angeles, CA. Attended school in Rhode Island (2005-2010) and Maryland (2010-2012). Project manager for Lijiang Studio. Currently interested in: sacred geometry, avatar vs. simulacra, gender-apathy and the invisible queer. He Jixing was born in 1995. He is a neighbor of Lijiang Studio, currently studying at Yunnan Agricultural University. He plays a deer in the Qilin Dance. He also worked with artists at the Tai Project in Kunming. He Xiudong, born 1980, Tacheng, Yunnan, China. Dongba ritual specialist, works at the Dongba Research Institute, Lijiang. Has participated in many Lijiang Studio projects since 2005 including Jianghu Journey, Memory Holder, Another China, Our Homeland! Gone Just Like That, recording a CD on Yasuhiro Morinaga’s label Concrete. He is currently Wu Zhimi’s teacher. Jay Brown (1977, Washington, DC). In 2004 Jay founded Lijiang Studio, an arts practice based in a rural farming village in southwest China’s Yunnan Province. Since then, Lijiang Studio has facilitated and produced about 100 residencies and 35 exhibitions in urban, rural, domestic, public, and private settings. These events are co-curated with the artists involved and with members of that local community. Josh Sinton is a Brooklyn-based improviser and composer who specializes in the bass clarinet and baritone saxophone. He leads the bands Ideal Bread and musicianer as well as programming the series Three Conic Sections and 65Fen Music. Currently he can be heard playing solo and in the Nate Wooley Quintet, the Tri-Centric Orchestra, SAVAK and Spinifex Maximus. Li Jianhong is a Chinese free improv guitarist and a leading figure in mainland China's free improvisation music scene. His involvement in China’s experimental / noise / avant-garde culture started from the late 1990s, during which he was the founder of one of the earliest experimental/noise/avant-garde music label 2pi Records and later the label C.F.I, and also members of groups such as Second Skin, D!O!D!O!D!, VagusNerve and Mind Fiber. He also curated noise / sound art / Avant-garde music festival “2pi Festival” annually from 2003 to 2007, which was one of the most important festivals in the early development stage of China's experiment, noise and avant-garde music. In 2004, he also curated series performances and gigs named "Home Violence". In 2011, he cofound a new label "C.F.I" with VAVABOND, which delicates to promoting China free improvised music. (2006-2009), producing residency projects, the curator of he Lijiang Studio Mural Project. Matt Sargent is a musician based in Buffalo, NY. His music grows out of an appreciation of natural resonances, recursive structures, computer modeling, and outdoor listening. His music has recently been heard in performances and installations at the Wulf (Los Angeles), the Machine Project (Los Angeles), Hemphill Fine Arts (Washington D.C.), the Stone (New York), Constellation (Chicago), MOCA Cleveland, SEAMUS, and the Yale University Haskins Laboratory, along with residencies at the Goldwell Open Air Museum (Rhyolite, NV), Atlantic Center for the Arts, and University of Nevada Las Vegas. Matt is a visiting assistant professor of electronic music and sound at Bard College. Mark Clifford is a vibraphonist, composer,and percussionist based in Oakland, CA. He has had the honor of playing with: Jeff Parker, Kjell Nordeson, Ches Smith, Joan La Barbara, Aram Shelton, Colin Stranahan, Scott Amendola, Tatsuya Nakatani, Ron Miles, Danny Meyer, Lisa Mezzacappa, So Percussion, SF Sound, Oakland Active Orchestra, and has served as a percussionist with the Colorado Symphony Orchestra. He is the leader of The Dirty Snacks Ensemble, a post jazz ensemble in which he serves as the composer, vibraphonist, and vocalist. Clifford studied Percussion under Colorado Symphony Orchestra master percussionist John Kinzie, Jazz Theory under Eric Gunnison, and Composition under William Hill. Clifford studied percussion and marimba at Nagoya University in Japan with Tomomi Sugo and has studied vibraphone with two of his greatest heroes, Steve Nelson and Matt Moran. Miranda Hill is a double bassist, producer, and educator, who balances a busy classical performing career with more experimental pursuits. She's the founder and director of 3 Shades Black; the "Flying Tapirs" theatre-music duo with Leah Scholes; and Fine Fine Small Mountain, who have just returned from a 6 month residency in rural China. As a bassist, Miranda studied at the Victorian College of the Arts, the University of Michigan and the Hartt School of Music. She has performed with the Adelaide and Melbourne Symphony Orchestras, Orchestra Victoria, Opera Australia, the Melbourne Ring Orchestra, The Australian Brandenburg Orchestra and many others. As a new music and chamber music performer, Miranda plays with BOLT ensemble, Arcko Symphonic Ensemble, 6 degrees ensemble, and the early Scottish music quartet, the Evergreen ensemble. Naima Fine Fine is a 37 year old composer and ecologist from Australia. After several years of ecological work, she has moved back towards composing with new insight. Naima studied composition at the Griffith University’s Queensland Conservatorium of Music, followed by an Honours degree in Ecology and Conservation Biology. She has done ecological studies on a variety of flora and fauna in Brunei, far north Queensland, the Northern Territory, and northern NSW. She has composed for short film; live circus; and amateur and professional ensembles. She has just finished a 6-month artist residency at LiJiang Studio as part of Fine Fine Small Mountain. Some of Naima's musical influences include minimalism, jazz, and gamelan. Ecological influences include fractal, cellular and diatomatic patterns; and the general amazingness of nature. She is in the slow process of developing a single practice that combines her creative, political and scientific knowledge and ideas. Na Yingyu was born in Heilongjiang Province in 1973. He now lives and works in Beijing. He experiments with video, film, photography and live video. His works were showed and collected in Israel, Lithuania, Austria, Brazil, Holland, America, Canada, Thailand and Germany. His most resent solo exhibition was at Location One in New York and Brown University. He has also performed with Chinese bands and musicians like Zuoxiao Zuzhou, SUBS and Omnipotent Youth Society as their VJ in music festivals. Sarah Lewison is an artist, writer and activist whose work centers on political ecology, intersubjectivity and critical pedagogies. Her installation, performance and media projects address relationships between spectators, producers and other living objects through play, dialogue and objects or images for contemplation. She has presented work in public and in independent spaces throughout the US and internationally. Sylvia Winkler (*1969/Austria) / Stephan Köperl (*1966/West-Germany). In their collaborative artistic practice they have carried out "interventions in urban space" since 1997. These are documented these using video, photography or text. Our temporary interventions are developed specifically for each situation and are always the result of observations we make on location. They have created numerous works at Lijiang Studio, among them “Medicaid” and “That Summer”. Apprentice Dongba. Recent projects include: Dongba dance book, Dongba crown for female practitioners, contemporary (revised) funeral scroll, adapting Dongba ritual for American landscape/ locale. WuZhimi is a Frog Wing avatar. Yasuhiro MORINAGA (1980, Japan) is a Japanese music director, sound designer, sound archivist and the composer of concrete music. He has worked on multiple projects in film, contemporary dance, installation, and the performing arts. Also he has been engaged in field sound recording and specialized in the traditional and ritual music of Southeast Asia. Through the use of recording materials, he creates soundscape and concrete music. He runs the record label "Concrete".